AMSTERDAM, The Netherlands – At IBC 2015, HARMAN’s JBL Professional is pleased to announce its new 7 Series Master Reference Monitors are in production and now shipping. Developed to meet the requirements of broadcast and post-production facilities that produce content in immersive audio formats, the LSR708i and 705i Master Reference Monitors are the heart of a complete, modular system that can be scaled to any size production room and any number of channels. 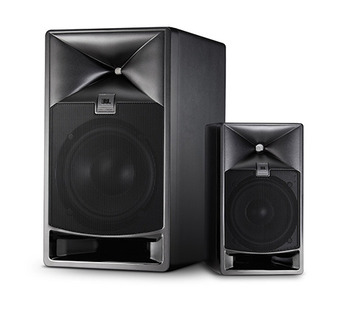 With the launch of the 705i and 708i, JBL raises the bar and expectations for studio monitor performance. The 708i 8-inch two-way, and 705i 5-inch 2-way installed monitors offer remarkable frequency response and output that belie their small size. To deliver exceptional performance, JBL developed a new miniature high-frequency transducer—the 2409H—featuring JBL’s low-mass, annular diaphragm design that allows very high output with low distortion and high frequency response to 36kHz. JBL also engineered two new high-excursion 5-inch and 8-inch woofers, the 725G and 728G that give the 708i and 705i robust low-frequency output into the 30Hz range and peak system output of 113dB and 107dB respectively. JBL’s distinctive patent-pending Image Control Waveguide and a sophisticated dividing network work in concert to produce an imperceptible crossover transition, detailed, spatial imaging and neutral response, particularly in the critical dialog range. Front-ported birch plywood install-ready enclosures include bottom and rear-panel mounting points. With a range of available mounting brackets, the speakers’ placement can be optimized to maintain sight lines to video displays. To reduce enclosure size and installation cost, the speakers are centrally powered by HARMAN’s Crown DCi 8|300N eight and four-channel power amplifiers. The 705i and 708i can be driven by a single amp channel or bi-amplified, and tuned for room-to-room consistency Added to the 7 Series system, HARMAN’s BSS Soundweb London signal processor can be networked with the amplifiers to provide down-mix, sophisticated bass management capabilities and a range of I/O options including AES, Dante, and AVB. The entire system can be externally controlled using HARMAN HiQnet Audio Architect™ software, a hardware controller, or wireless tablet.